When Marc Benioff started Salesforce back in 1999, it was a typical CRM solution which could automate the sales process. Today, after almost two decades, Salesforce has become the world’s #1 CRM provider & offers a gamut of other cloud solutions. Innovation with the time and market adaptability has made Salesforce the market leader. They kept on adding new products and solutions along with their key acquisitions. Today if you see Salesforce’s gamut of offerings, they have got all the solutions which can help any business thrive by optimizing key business verticals and reducing operational costs. In 2001, Salesforce launched their first online sales automation solution and since then there was no looking back. They had 400+ employees across the globe by 2003 and in 2004, they offered IPO in NYCE raising 110 million USD. By 2010, Salesforce had 1.31 billion USD of revenue. When you use a solution, you will generate a lot of data. And in most of the cases, you would like to keep your old data for various reasons. Companies were generating data while using the Sales Cloud, and when they started using other Salesforce solutions like Service Cloud, Pardot, Financial Cloud, Community Cloud, AppExchange solutions etc., the data which was getting generated started growing exponentially. There was a common question from all the Salesforce customers: “how are we going to manage this huge volume of data in the limited offered data storage space?” When the data grew from hundreds of millions to billions of records, Salesforce suggested their customers to purchase additional data storage space or store it in some external system and integrate. However, as the additional data storage space was highly expensive, the only feasible solution was “Store it elsewhere and integrate.” As a customer focused company, Salesforce wanted their customers to get the best out of their huge volume of data by using the core Salesforce infrastructure. Innovation happened. In 2018, Big Objects solution was born. As a Salesforce user, you know all about standard objects, custom objects, and external objects. You are pretty well aware of how these objects help you control and manipulate data so you can do some amazing innovations with your org or external systems. In today’s era of big data, every business often finds themselves with a huge volume of data. In most of the cases, too much data brings too many dilemmas. Performance issues, storage challenges, complexities in adhering to compliance and audit requests and much more. Big Objects is Salesforce’s big data solution which allows you to store and manage a massive amount of data (billions of records or more) within the Salesforce platform. The performance will not take a hit and it will be consistent with easy accessibility through a standard set of APIs to your org or external system. There are two kinds of Big Objects. These are defined by Salesforce and included in Salesforce products. Eg: FieldHistoryArchive which allows you to store up to 10 years or more of archived field history data helping you comply with industry regulations related to auditing and data retention. These are defined and deployed by you through the Metadata API. To define a custom big object, you create an object file that contains its definition, fields, and index, along with a permission set to define the permissions for each field, and a package file to define the contents of the object metadata. But the good news is, in their latest Spring ‘19 Release, Salesforce has added the most awaited feature and offers an option to create custom big objects from set-up. If you aren’t comfortable using the Metadata API, you can create a big object in Setup, define its fields, and build the index that defines how the big object is queried. A Salesforce user can bring a lot of innovations with Big Objects. When data has been brought from various systems and storage solutions to the Salesforce ecosystem, wonders can happen with your data. The same huge volume of data can help you grow your business at an exponential rate. No need to have integrations with external systems or maintain that for a long period of time. Big Objects can be used for three specific use cases. While a 360-degree view of your customers can help you optimize your customer journeys and get a comprehensive view of your customers, this can help you pull all the data from various sources and systems to one single integrated Big Objects database. Auditing and Tracking will help you keep a long-term view of your user’s Salesforce usage for analysis or compliance purposes. This feature is extremely useful for heavily regulated industries like financial, healthcare, government etc. But, the real perk that Big Objects offers is the historical archive option which can potentially solve the age-old Salesforce data storage problem. 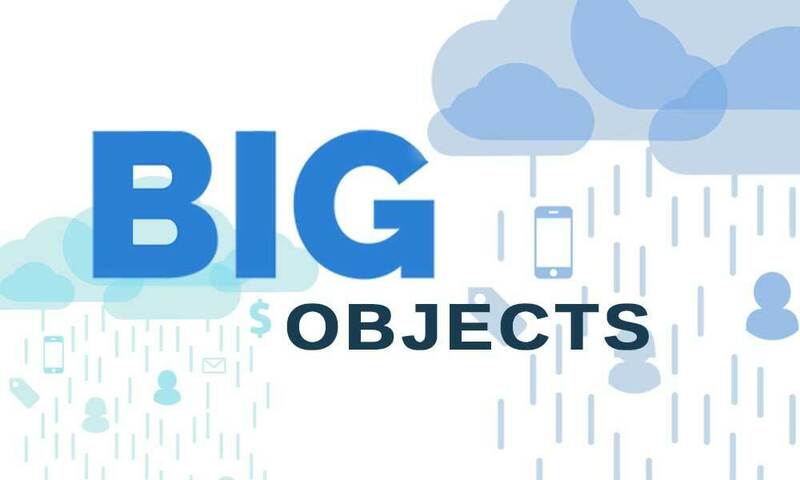 Why Big Objects is the best answer to Salesforce data storage challenges? Standard or external objects are great when you are dealing with millions of rows of data. But when you reach a level of billions of rows in Salesforce, you would need additional storage space. And Salesforce additional storage costs plenty. Big Objects offers a solution or storage option where you can store all your lesser accessed historical data which you are not using anymore. Your historical data will be well-within your Salesforce ecosystem without been exposed to external systems. This is cost-effective and offers you an advantage of having a huge volume of your historical data archived yet readily available. In other systems, you might need to have integrations and have to maintain it. If you are from data-sensitive industries like healthcare, government, financial etc. you would never like to compromise the security of your data. In that case, Big Objects is the solution that you need as it is a giant basement for data storage on the Salesforce platform. Deleting data is no more an option. You never know when you have to face regulators. Keeping your old data archived with the highest level of security and scalability in the Big Objects will allow you to face regulatory challenges effectively. Big Objects is a storage option. But you need a solution which can archive your historical data and keep it securely in the Big Objects. DataArchiva is the first native Salesforce data archiving solution powered by the Big Objects. By periodically archiving your historical data, DataArchiva can potentially save 80%+ of your data storage costs. Your application performance will never take a blow and you can store billions of records for years. With a customer base spanning across the globe from various industries, DataArchiva is the one-stop solution for all your Salesforce data archival needs. To know more, do get in touch with our expert today.